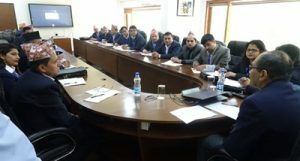 New Delhi :The Ministry of External Affairs has organised a training course for the officials of the Government of Nepal under the Indian Technical and Economic Cooperation (ITEC) programme. A second group of 20 officials of Nepal’s Ministry of Finance joined their training course on ‘Global Perspectives on Public Financial Management’ at the Institute of Government Accounts and Finance (INGAF) in New Delhi on Monday. PM Modi to address convention..
Government suspends LoC trade in..
Jet Airways issue: Civil Aviation.. Political leaders hold rallies in..
Delhi court rejects interim bail.. Nomination for 5th phase of..